HomeMeetings & CoursesFocused TopicsSAFE Opioid Prescribing: Strategies. Assessment. Fundamentals. Education. The need for education that will help medical professionals respond to the opioid epidemic is increasing. Here is a free program that can help. Click to expand and see full image. 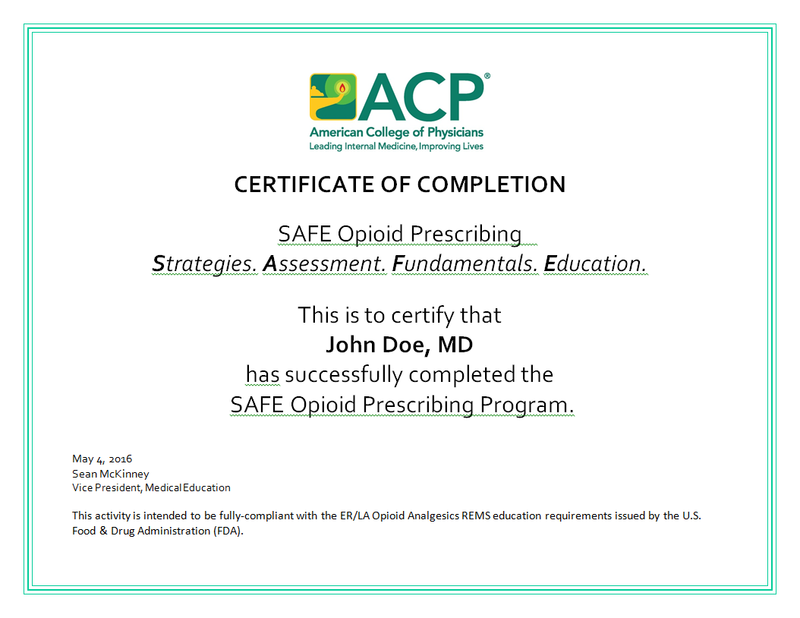 The SAFE Opioid Course provides guidance that is essential for safe and effective pain management when prescribing extended-release (ER) and long-acting (LA) opioids. It is critical to recognize best practices for how to start to therapy with ER/LA, how to provide therapy, how to end therapy, and what to do in between. Evidence-based tools are required for screening at-risk patients and for monitoring adherence to prescribed ER/LA opioids. Proven methods to counsel patients on ER/LA opioids and to achieve positive outcomes need to be employed. Comprehensive information is also essential on ER/LA-opioids as a drug class. This recorded course will provide clinical insights from the SAFE Opioid Prescribing Blueprint. This activity features six half-hour educational segments, plus questions and answers facilitated by expert faculty. This SAFE Opioid Course—a Risk Evaluation and Mitigation Strategy (REMS) activity—allows you to leave the site and return to complete the course in segments, depending on your schedule. To earn CME credit and ABIM Medical Knowledge MOC points, you must complete all six modules and correctly answer at least seven of 12 medical knowledge questions. The American College of Physicians is accredited by the Accreditation Council for Continuing Medical Education (ACCME) to provide continuing medical education (CME) for physicians. The ACP designates this enduring material for 3.5 AMA PRA Category 1 Credits™. Physicians should claim only the credit commensurate with the extent of their participation in the activity. Successful completion of this CME activity, which includes participation in the evaluation component, enables the participant to earn up to 3.5 points in Medical Knowledge and Patient Safety in the American Board of Internal Medicine’s (ABIM) Maintenance of Certification (MOC) program. Participants will earn MOC points equivalent to the amount of CME credits claimed for the activity. It is the CME activity provider’s responsibility to submit participant completion information to ACCME for the purpose of granting ABIM MOC points. Those who complete this activity will also earn a REMS Certificate of Completion (shown above). By submitting for MOC points you hereby grant permission to share your completion information for this activity with the ACCME. This educational activity is supported by an independent educational grant from the ER/LA Opioid Analgesic REMS program companies. This activity is fully compliant with the ER/LA Opioid Analgesic REMS education requirements issued by the U.S. Food & Drug Administration (FDA).